Wouldn't it be thrilling to hold the yoke of an airplane and fly? Or how about building your own rocket? Or wouldn't it be cool to see and learn the inner workings of some of your favorite air shows? Or how amazing would it be to see how our police dismantle bombs and other explosives? That, and much more, are all possible in the Civil Air Patrol. Many cadets of the Sugar Valley Composite Squadron, located at Sugar Valley Airport in Davie County, have experienced flight through the Civil Air Patrol. This program, called Orientation Flights, aims to get Civil Air Patrol cadets flying, free of charge. Cadets can take 5 flights in an airplane, and 5 in a glider. One such cadet of the Sugar Valley Composite Squadron is Frank McAuley. "After we had finished the safety checks for the airplane, I got to start out first!" says McAuley. "When I got in, I was scared out of my mind, and when Colonel Wayne Byerly let me take control, I was shaking so hard I thought any little wind was going to blow me off course! It was fun." Just recently, during this year's Winston-Salem Air Show, Civil Air Patrol cadets assisted in the air show. They helped set up on Friday, "manned" crowd control on Saturday and Sunday, and enjoyed the aerobatics performed by pilots. There were over forty Civil Air Patrol cadets from the region that provided support for the air show. Christopher Herman, Jr., a cadet from the Sugar Valley Composite Squadron, was one such cadet. "I had many duties throughout the air show such as patrolling the tent area at night, patrolling the static display aircraft for any visitor violations, moving static display aircraft to the “hot boxes,” guarding the flight line from pedestrians, and guarding a special jet. I was interested mostly in the Aeroshell’s aerobat who put up a great performance. It was a very fun and interesting event." Rocketry is something that appeals to many Civil Air Patrol cadets. Sugar Valley Airport recently hosted a rocketry event. The cadets had fun and learned about the science of rocket design, development and flight. Nick Russell, a cadet of Sugar Valley, had this to say: "I thought they were exciting and educational . I really enjoyed my time." Sugar Valley Composite Squadron's Deputy Commander of Cadets, Lt. Lee Kosub, describes the event: "Civil Air Patrol cadets and senior members descended on Sugar Valley Airport for a fun-filled weekend of rocket building and high-speed launches. Seventeen cadets from South Charlotte, Statesville, Winston-Salem, and Sugar Valley gathered . . . to build single-stage and two-stage rockets. After building the rockets on Friday night, many of the cadets and their families camped out by Sugar Valley’s idyllic lake and fire circle. The campers were up bright and early Saturday morning for the much-anticipated launches. Every cadet in attendance successfully launched a rocket." A few weeks after the air show, over 280 Civil Air Patrol members from both North Carolina and South Carolina attended the annual Wing Conference held in Charlotte, North Carolina. Over 80 of the 280 attendees were cadets. Benjamin and Hannah Phillips, of the Sugar Valley Composite Squadron, were able to meet Mary Feik, a senior master aircraft mechanic, pilot and instructor who wrote several WWII aircraft manuals, and after whom the third achievement in the Civil Air Patrol cadet program is named. "It was quite a pleasant surprise to meet Mary Feik," Hannah said. "She told us many of her personal experiences, and encouraged us to do our best." During the Conference, the Charlotte/Mecklenburg Police Department visited the cadets and presented some of their equipment, which included a robot. "It was very interesting to discover how explosive devices can be safely removed from an endangered structure and later detonated using a robot," said Benjamin. Cadets Benjamin and Hannah Phillips also had the opportunity to demonstrate a VEX robot in a presentation by Major Eric Orgain, the Wing Aerospace Director and Commander of the Sugar Valley Composite Squadron. The cadets enjoyed the Wing Conference and said they would "definitely go again next year." On October 26, Sugar Valley airport held their annual fly-in. From 8:00 a.m. to 4:00 p.m., children and adults alike had the opportunity to see many various aircraft and enjoy aviation. For those who are ages 8-17, Young Eagle flights were available, free of charge. These flights are targeted toward those who have never flown and would like to do so. Several surrounding Civil Air Patrol squadrons will be present, providing information about the Civil Air Patrol, and guarding the flight line. For more information to register for a Young Eagle Flight, contact Sugar Valley Airport at 336-998-3971. 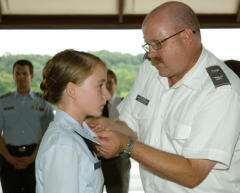 The Civil Air Patrol is a great program for everyone, and is fun and rewarding. Many opportunities exist for each member. If you are interested, you can contact Sugar Valley Airport at 336-998-3971, or you can visit the Sugar Valley Composite Squadron on Tuesday nights at 6:30-8:30 to see what the Civil Air Patrol is like.